The Society’s first publication dates to 2001, when the Society’s late Vice-Chairman, Willie Gunn, compiled a fascinating collection of reports and stories from The Northern Times, the local weekly newspaper of Sutherland, into a single volume. The book is now sold out. This Society book was published just before Christmas 2005. Norman Gibson, the Society’s Speaker Secretary. Pictures from the book form some of the pictures in this web site. 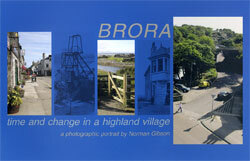 This Clyne Heritage Society publication took its starting point from an earlier book entitled Views of Brora & District and published early last century by J. Sinclair, a local merchant. Sinclair's volume is composed of reproductions based on monochrome postcards from Valentine and Sons of Dundee. In 2004, the Society was presented with a copy for its permanent collection by Evelyn and Rosemary, daughters of the late Millicent Phillips, and that seemed an opportune moment to initiate a new series of photographs from the beginning of the 21st Century and to set these alongside those from the start of the 20th. Clyne Heritage Society has published its first annual Journal, which contains a series of papers drawn from speakers who gave talks during the previous winter’s lecture programme. It has also been boosted by the addition of other papers on relevant local heritage matters by members of the committee. Presented in A4 size, it has 71 pages of text with lavish black and white illustrations and retails for £7.50.